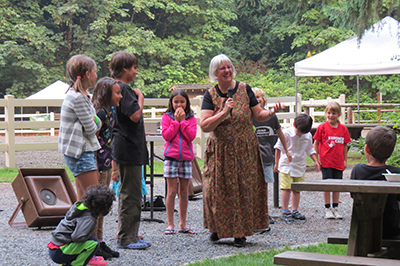 After everyone was treated to a make-your-own sundae at the sundae bar, folklorist and storyteller Margaret Read MacDonald enthralled the kids during this beautiful evening of stories and folk tales. The magic happened as Margaret increasingly involved the kids in some of the many stories she has collected from around the world. “Too Many Fairies” was a Celtic tale about how fairies were driving an old woman crazy by cleaning up then messing up her house over and over again, with the kids playing the parts of brooms, dishes, bedclothes, and other elements of the household. In “Farmyard Jamboree,” kids played the parts of farm animals and their babies, and we heard some good and, well, sketchy, imitations of chickens, rabbits, and other animals. Nearly the entire audience, kids and adults, were needed in the final story to bring down the rain (something we could really use in the park!). Lots of fun and laughs were had by the 50 people, including more than 20 children, who came out for the event.